Kyle Lowry had 16 points and collected his 5,000th career assist for the Raptors. 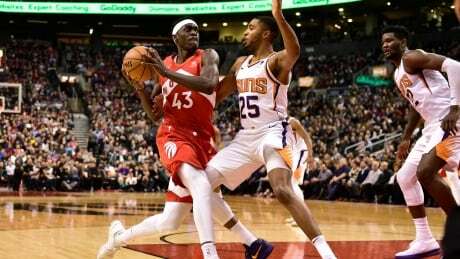 Lowry and Serge Ibaka, who finished with 22 points, turned it on in the fourth quarter but the Suns refused to go away. Kelly Oubre Jr. missed his shot but an Ibaka foul sent Mikal Bridges to the line with 13 seconds left. He made both. Toronto (34-13) was without Kawhi Leonard (rest), Jonas Valanciunas (thumb) and OG Anunoby (personal). Booker led Phoenix (11-35) with 30 points. He came into the game needing just six assists to reach 5,000 for his career. He collected No. 6 in the fourth quarter, feeding Serge Ibaka for a bucket. Lowry finished with eight assists. C.J. Miles had been listed as questionable with a sore hip but was able to play. He finished with 13 points. An 11-0 run in the first quarter put the Raptors up 21-11. Miles, who had been averaging 4.7 points a game, contributed seven points in three minutes as Toronto led 32-20 at the end of the quarter. Toronto backup centre Greg Monroe, averaging 5.2 points a night, picked up the slack with six points in a second quarter that saw the Raptors stretch the lead to 41-25. A 7-0 Suns run cut into the Toronto advantage but the Raptors led 57-49 at the half. 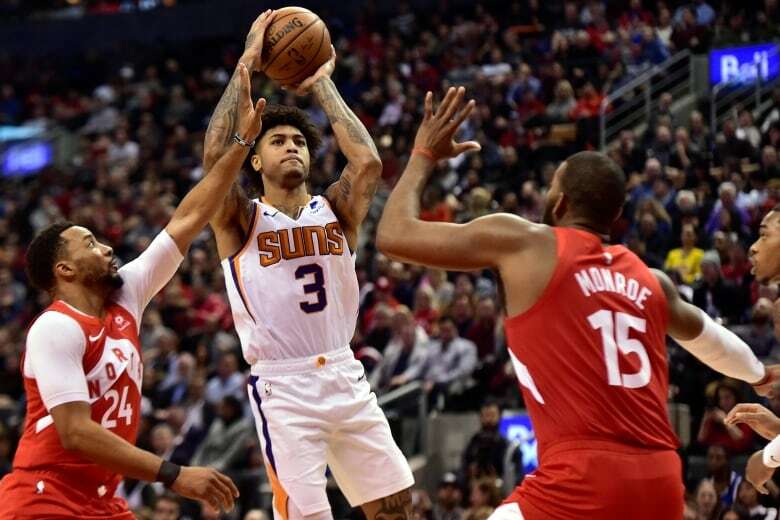 While Phoenix only shot 38.3 per cent in the first half — compared to 60 per cent for Toronto — 11 offensive rebounds led to a 19-6 Suns advantage in second-chance points. A 9-2 run to open the second half brought Phoenix to within one at 59-58. The Suns tied it up at 67-67 on a Bridges' three-pointer midway through the quarter. Toronto's offence went cold and Phoenix pulled ahead 76-75 with 1:45 remaining in the third, its first lead since 11-10 in the opening quarter. Toronto had not lost on consecutive days since Dec. 26-27, 2017 (at Dallas and Oklahoma City). Since then it has split nine back-to-back sets and swept nine.